The culmination of any feedback survey or performance review process is the final report. A target's report is downloadable anytime and can be easily customized. Option 1: Generate one Target's report at a time. On the project home page you will see a list of all your targets. To the right of the Target's name you will see a link that says PDF Report. Click on the PDF report link. Choose the template you want to use to generate the report. Choose the minimum amount of responses required for each item for non-managerial and self groups (optional). ***Filter intensity settings can be found in the Setup tab » Advanced Settings reports section. This feature is not available for Starter accounts. Once the report has generated, a link will be provided so you can download it. 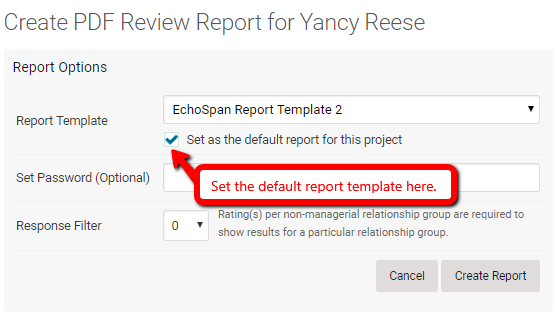 To set a default report template in your project, follow the additional steps below. The report template used will become the default for report selection in the Admin tool going forward for the current project (and projects cloned from it) when Admins run ad-hoc reports. Check the box next to the option to Set as the default report template for this project. Option 2: Generate multiple Targets' reports at one time. You can batch your reports to be generated by the system so you do not have to run them one at a time. From the drop-down menu, select Reports>>Batch PDF Reports. Select the report template you want to use to generate your reports. Choose the minimum amount of responses required for each item of non-managerial and self-groups (optional). ***Filter intensity settings can be found in the Setup tab » Advanced Settings report section. This feature is not available for Starter accounts. Select whether you would like Targets from "This project only" or "All active projects" displayed below. 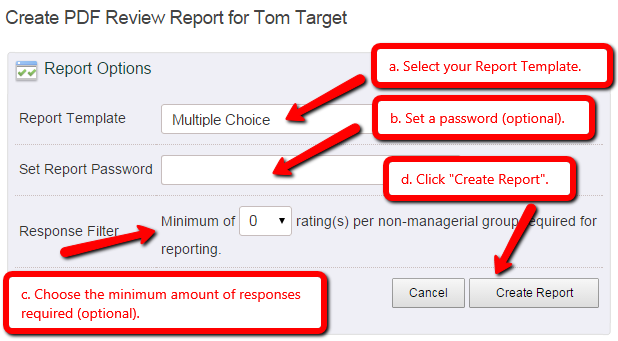 Select the Targets whose reports you want to generate, and click "Batch SELECTED Reports". Or you can click "Batch ALL Reports" to generate all of the reports. If you are selecting the reports you would like generated, you will need to complete the selection process for each page of names. You can expand the view of how many Targets are shown by page using the Results Per Page drop-down. Option 3: Setup the Autopilot to generate your reports on a certain date. 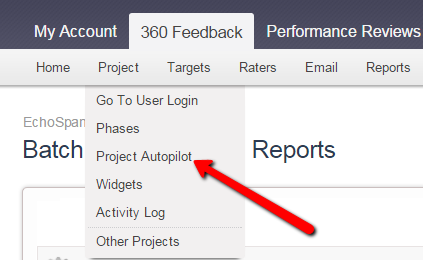 From the drop-down menu, select Project>> Project Autopilot. Scroll down to the Reports section and find the Batch PDF Reports for all Targets in Project option. Select a report template to use to generate the reports. Set your minimum filter (optional). Enter a date for the reports to be generated formatted as such MM/DD/YYYY. Scroll to the bottom of the page and click "Save Settings".